Gypsy is one of those classic Broadway musicals where the songs—including "Everything's Coming Up Roses" and "Let Me Entertain You"—are arguably better known to the general public than the show itself is. That's a shame, because Gypsy, by Arthur Laurents, Jule Styne and Stephen Sondheim, is a sensational show. 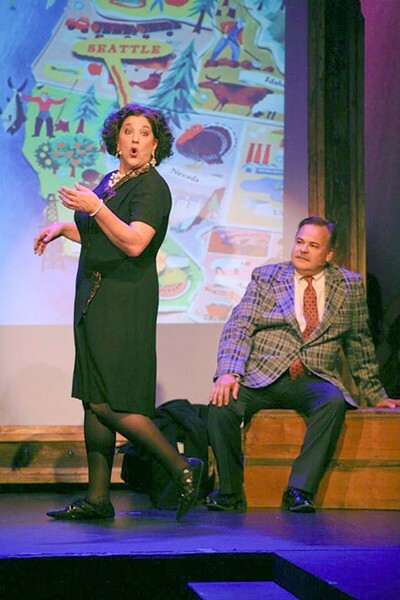 Sonoma Arts Live's production, directed with obvious love and loads of heart by Michael Ross, shows us why. Though occasionally sluggish—and musically wobbly to a maddening degree—this otherwise first-rate production features some truly sensational, must-see performances, if only the orchestra, under musical director John Partridge, were as strong and energetic as the cast. With better musical support, this could (and should) have been one of the best shows of 2017. Even so, it frequently comes close. A huge hit when it debuted on Broadway in 1959, Gypsy is based on the memoir of Gypsy Rose Lee, a 1930s striptease pioneer. An homage to the golden age of Burlesque—and partly a psychological analysis of Lee's obsessive, compulsively self-defeating mother, Rose—Gypsy, as storytelling, is both heartwarming and heartbreaking. Over the course of several years, Mama Rose (a magnificent Daniela Innocenti Beem) drags her daughters Louise (first Sofia Carlson, then Danielle DeBow) and June (Tuolumne Bunter, Amanda Pedersen) from one Vaudeville theater to another, in hopes of turning the singing-and-dancing June into a star. Louise, meanwhile, is left in the shadows. Beem is brilliant, playing Mama Rose with ferocious energy, her beautiful belter's voice and high-voltage charm convincing us she could make anyone believe that her own dreams of stardom are their dreams too. She's not the only star in the show, however. As Herbie, Rose's patient paramour and agent, Tim Setzer is outstanding. He gives Herbie a sense of goodness and devotion that make his eventual moment of realization all the more shattering. And DeBow, as the teenage Louise—eventually forced into working as a stripper to pay the bills—is also wonderful. Her big transformation scene, as we watch Louise become the hardened Gypsy Rose Lee through a quick series of confidence-raising, risk-taking performances, is sad, complex, unexpected and absolutely thrilling. 'Gypsy' runs through July 30 at Andrews Hall, 276 E. Napa St., Sonoma. Thursday–Saturday, 7:30pm; Sunday, 2pm. $22–$37. 866.710.8942.